For June 1998 . . . 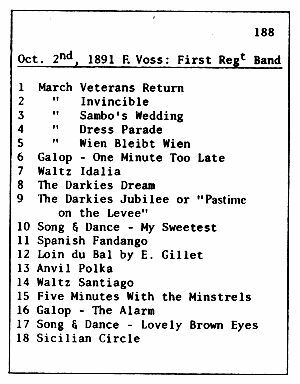 This month: From 1891, an early brown wax cylinder recording, Five Minutes With the Minstrels played by Voss's First Regiment Band. Announcement "Five Minutes With the Minstrels, played by the First Regiment Band at Orange, New Jersey." This record can be precisely placed and dated, thanks to a logbook kept from May 1889 through April 1892 by Edison's sound recording engineer, A. Theo E. Wangemann. 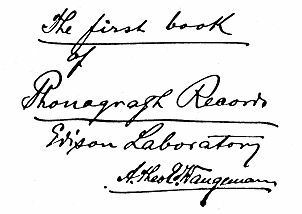 In his logbook, "The First Book of Phonograph Records, Edison Laboratory", Wangemann details the earliest recording sessions during the birth of the wax recording industry. Edison Cylinder Records, 1889-1912, New York: APM Press, 1990. On October 2, 1891 during the 15th round of recording that day, F. Voss's First Regiment Band recorded this cylinder. The recording is announced as being done "at Orange, New Jersey". 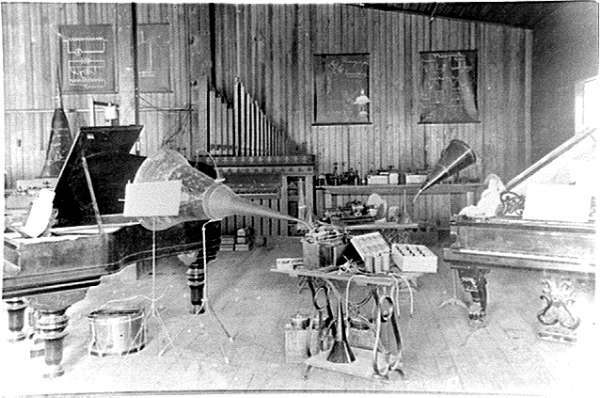 Doubtless, that would be Edison's Laboratory at West Orange, New Jersey, and very likely specifically in the laboratory's music room (to learn more, click here). Incidentally, according the archive staff at the Edison National Historic Site, Orange was often cited instead of West Orange possibly because neighboring Orange was the better known locale, plus the area post office was in Orange. This is an original recording (not a copy from another record)  best listened to with headphones  with a strong bass (as low as 115Hz) and a great ambient feel, despite the surface noises (which, in this case, are not due to mold or mildew but to wear from repeated plays of the very soft wax which is common in these early brown wax records). Most recordings of this era have not survived. Being produced for the coin-in-the-slot nickelodeon arcades, they were often "played to death", then redeemed by the arcade operators  the worn wax recordings making their way back to the manufacturer's wax vat to be made into new blanks for the next go around. Although, not actually "Five Minutes With the Minstrels"  it's really 2½ minutes with a band medley  we can still enjoy, after more than 105 years, this nifty and well-recorded number.